A friend of mine was hosting an 18th c. themed birthday party this weekend, and I decided at the last minute that I wanted a new dress that lightweight enough to be comfortable in our lingering summer heat. 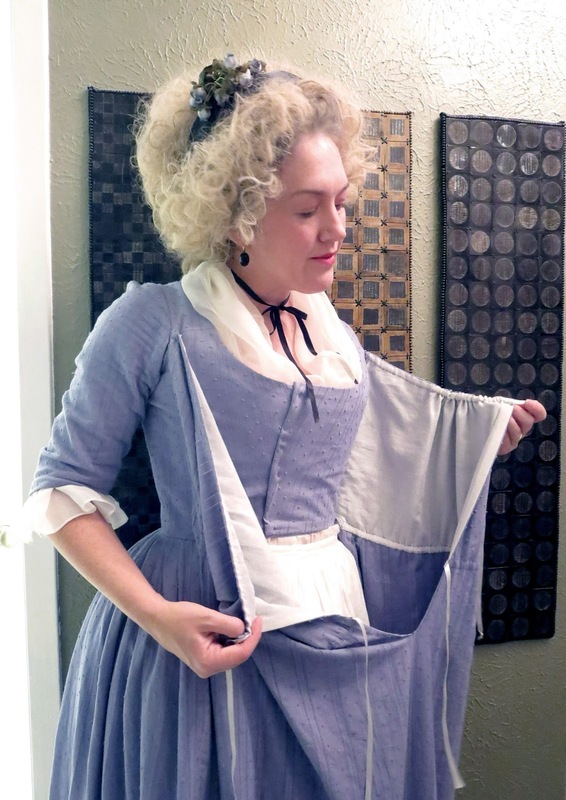 It's still in the high 90's here in Texas, so I thought a new chemise gown would be well worth a little detour from my other sewing and blogging plans. 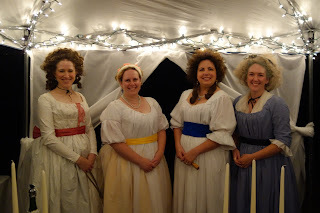 I also couldn't resist joining my friends, who were also wearing chemises to the party. I'm such a sucker for a theme! 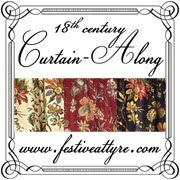 The fabric is a figured cotton with woven stripes and dots, and it was originally brown. I bleached it and then re-dyed it to be a periwinkle blue-grey color. I thought the color that I ended up with was a nice match to the hue in this lovely fashion plate from Cabinet des Modes. 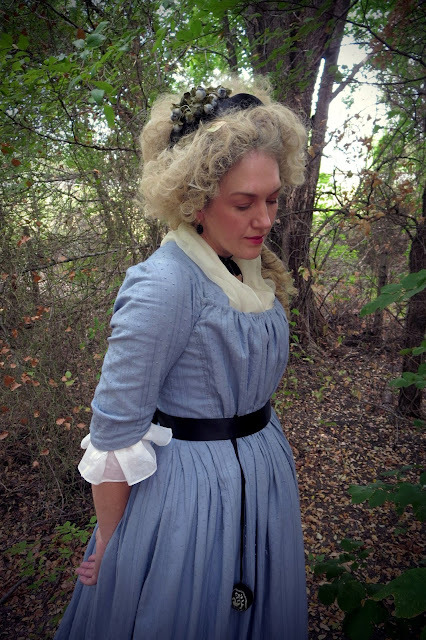 I originally wanted to make a ruffled neckline and hem to make my dress match this fashion plate even closer, but I only had around 4 yards of fabric to work with, so I didn't have enough left over for ruffles. 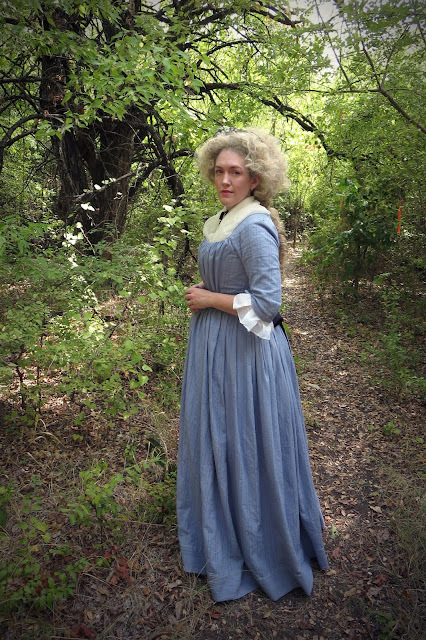 Although colored chemise gowns during this time period are plentiful, it's hard to find much evidence for cotton chemise gowns in colors other than white. Most of the surviving examples and period references show that colored chemises were typically made of silk. 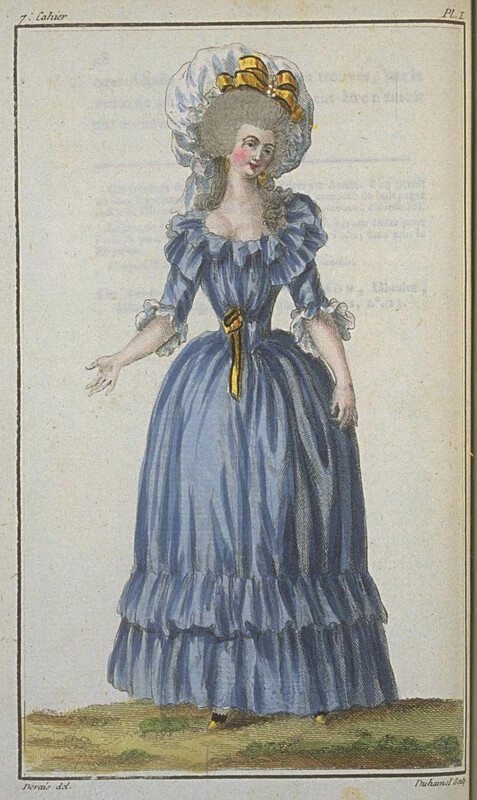 But there is one fashion plate that shows a chemise of pink English muslin, and as far as I know, 18th c. muslin was always made of cotton instead of silk, so I'm hoping that little tidbit of evidence is good enough to let me get away with this somewhat unusual material. I used the same basic pattern that I created for my black chemise a few years ago, but this time I made elbow length sleeves and only had 2 drawstrings on the bodice instead of 3. Chemise gowns with fitted backs are very easy to construct, and I think they are a lot less fiddly than the kind that are gathered all the way around. I took a picture while I was getting dressed to give you a peek at the construction. It's really just a basic round gown with a gathered section attached over the front of the bodice, and this panel is stitched down on to the bodice at the sides and tied in the center with ribbons. For the party last night, I just wore a simple ribbon and some flowers in my hair since this seems to be a very common look for ladies in portraits from the late 1780's and early 1790's. 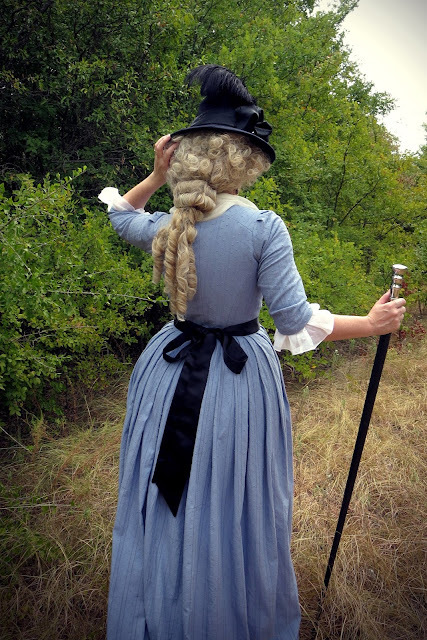 But I also loved the way the dress looked with my black tall hat, so I took some photos of both styles while tromping though the woods at my local park today. Here are a few of my favorite shots, and there are a few more pictures on flickr. Oh how gorgeous this dress is! And you in it! It's fun that you bleached brown and then redyed it to achieve this beautiful color! It looks so very great with the black accents! Brava you! gorgeous ! The picture of you sitting on dead tree is seriously beautiful ! Is it a pinball hanging from your waist ? It looks pretty too ! 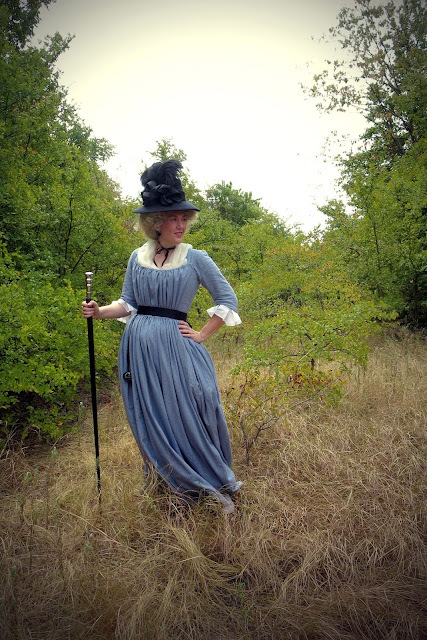 I made one in blue striped linen, (with complete disregard to historical accuracy) and it's really a Lovely gown to wear on a hot summer's day. You always look good in anything you make, but I think that is a bit special. I envy your figure and your skill - you always look perfectly in period. Thank-you, ladies! Marion - the pinball is a gift from one of my dear friends. She knits the most gorgeous things, and I love my little pinball like crazy! I wish I would have thought to take a close-up shot of it now. I'll be sure to post more about it next time I wear it. Isis - there is also a fashion plate of a dress described as grey linen - have you seen that one? https://www.pinterest.com/pin/186688347023939405/ I would totally wear a linen chemise too! I really, really love the silhouette of that dress. It's not a period of history I've ever looked at too closely but, clearly, I've missed out. What a lovely gown. this is beautiful!!! and thank you for the awesome construction/getting dressed pic. very helpful!! I love simple elegance, and your chemise gown exemplifies it. Brava! Your dress was so lovely, and you looked so comfortable in it! Also, that picture on the dead tree looks just like a painting. Love it! How lovely! It is amazing how certain looks come back in style - I had a ruffled neckline blouse that was very similar, in a similar blue, when I was in junior high. Two ruffles deep even. Denim-ish of coure, it was the early 90's! More than 20 years ago! Aaaah! 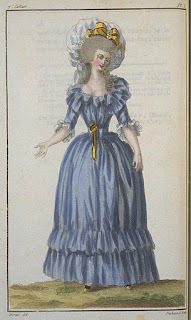 Weird how an 18C fashion print can trigger the awkward 13 year old memories in you. Oh, the awkwardness of that blouse... I used to grab a ruffle in my mouth to avoid showing non-existent cleavage when I bent over.